The Prime Minister, Shri Narendra Modi, visited Tiruppur in Tamil Nadu and unveiled several development projects in the State. PM unveiled several development projects from Perumanallur village in Tiruppur. 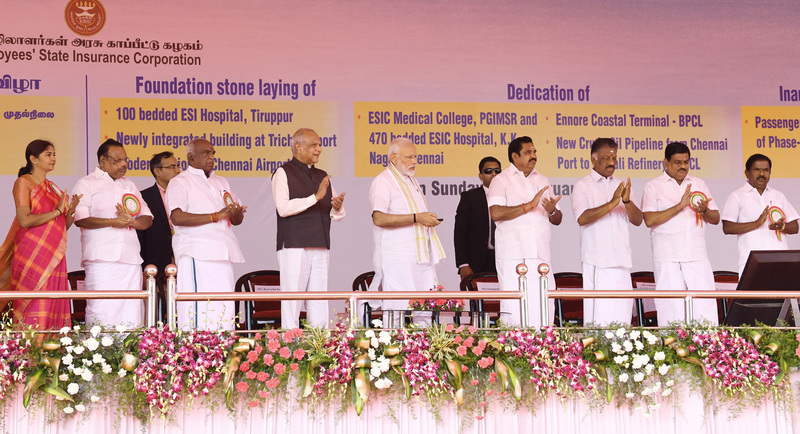 He laid the foundation Stone of Employees’ State Insurance Corporation’s (ESIC) multi speciality Hospital at Tiruppur. 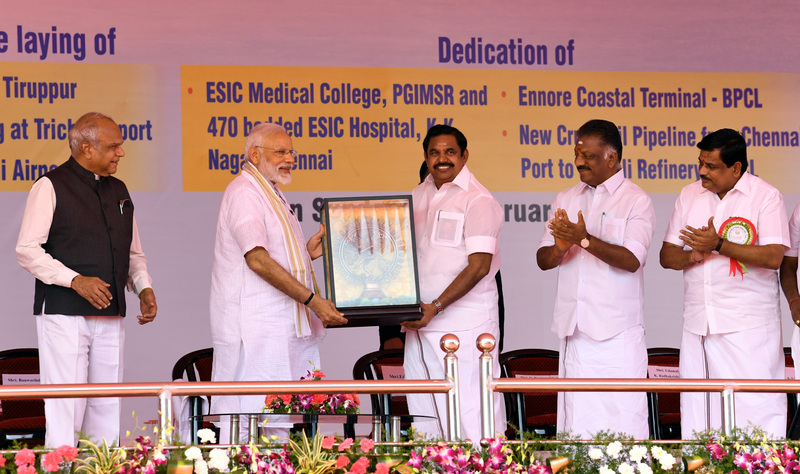 This State-of-the-art, 100- bedded Hospital will cater to the medical needs of over one-lakh workers and their family members in Tiruppur and nearby areas covered under ESI Act. Earlier these people were catered by the two ESIC dispensaries functioning in the city. For any advanced medical intervention, they had to travel at least 50 km to reach the ESIC Medical College Hospital in Coimbatore. He dedicated to the nation, ESIC Hospital Chennai. This 470-bedded hospital with state of art facilities will provide quality treatment on all disciplines of medicine. PM also laid foundation stone for a new integrated building at Trichy Airport and for the modernization of Chennai airport. With the new integrated Terminal building in Trichy, the airport can handle 3.63 million passengers per annum on full capacity and 2,900 passengers at peak hour with provision for expansion. Chennai airport will be modernized with provision of e gates, biometric based passenger screening systems, various other features and will decongest the existing international departure terminal. Bharat Petroleum Corporation Limited (BPCL’s) Ennore Coastal Terminal was dedicated to the nation on this occasion. It will be a bigger and better alternative to its Tondiarpet facility. With this terminal in place, products can be moved along the coast from Kochi, thereby also reducing the cost of movement by road. Prime Minister Modi also inaugurated new Crude Oil Pipeline from Chennai Port to Chennai Petroleum Corporation Limited’s (CPCL) Manali Refinery. The pipeline, built with enhanced safety features, will ensure safe and reliable supply of crude oil, and will cater to the needs of Tamil Nadu and neighbouring states. Passenger Service for a section of Chennai Metro from AG-DMS Metro station to Washermenpet Metro Station was inaugurated by PM. This 10 km section is a part of Phase-1 of Chennai Metro. With this stretch all 45 km of the Phase I project becomes operational. PM then proceeded to Hubli for the last leg of his journey today.